Content is king. But as the line between publishers and brands are blurring, all brands are finding themselves in both the content and the commerce games. And customers expect this. 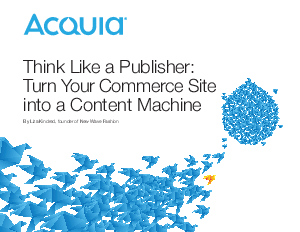 Consumers are very savvy today, and being able to attract and build a relationship with the consumer is key to brand success.This eBook will help you understand how to think like a publisher and turn your commerce site into a content machine.